While visiting Litchfield National Park, the stunningly beautiful waterfall region of Australia’s Northern Territory make the heritage-listed Historic Retreat, at Batchelor, 100kms South West of Darwin, your base for your personal exploration of the area. 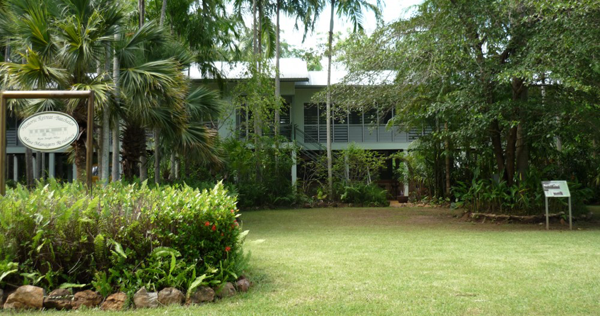 Historic Retreat offers unique Bed and Breakfast accommodation, which includes a chef cooked breakfast, where visitors can soak in the ambience of the purpose-built 1950s tropical home which celebrates the louvred and fan-cooled architecture of post WWII living, an architecture fast disappearing from the Top-End residential scene. It was the home of first Rum Jungle Mine Manager. Just relax in the extensive tropical gardens or learn more about Batchelor’s history from displays and memorabilia concerning early mining, farms, World War II sites and activities, and the Rum Jungle Uranium Mine , while planning your itinerary.